Hard surface flooring is an increasingly popular choice for Indianapolis homeowners. Hard surface flooring covers options like ceramic tile, porcelain tile, hardwood flooring, or luxury vinyl. These floors offer an amazing number of design choices and create gorgeous living areas. There is however, one common concern heard from people considering a hard surface floor: will it be comfortable underfoot? Area rugs are the perfect way to get that combination of practical, pretty and comfort. Area rugs come in all shapes and sizes, in all colors and patterns. They are a fun way to add a sense of style and design to your room - in addition to answering that concern about softness and comfort underfoot. Area rugs also help absorb sound and noise worries are the second most common concern we hear related to hard surface floors. Consider size: Area rugs come in so many sizes that it can be hard to know which one is best for your room. You don't want a rug so large that it looks like poorly measured carpet. But you also don't want a rug so small that it oddly floats in space. The right size for you is going to depend on the overall size of the room as well as the size of the area where you want the rug. Think outside the box: Rectangle rugs are great for hallways but if you want to define a sitting area, you might be better served by a square, circle or oval... or perhaps a custom-shape designed just for your space. Ask about custom options: A common issue for people looking for an area rug is that can't find one exactly the right size for their space. 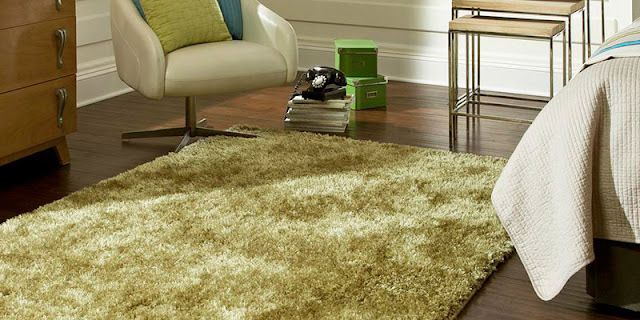 For the most part, area rugs are available in a set range of sizes. What can you do if those sizes aren't right for your room? Talk to Kermans. We can cut an area rug out of nearly any carpet style that will fit just right. Find a carpet style that you like - and with the hundreds of options we have in store, we're certain you'll find just the right color and design - and we'll create an area rug for you! Learn more about area rugs at Kermans.